Early on we decided that children at The Farmhouse would be given wonderful opportunities to continue enjoying their childhood. 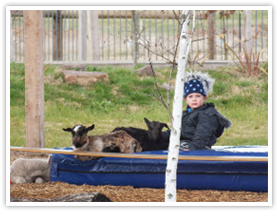 We’ve seen first-hand how children relish friendships with farmyard animals, so it only seems natural to incorporate the farm into childcare experiences. For us this life is normal – and we want to share it. 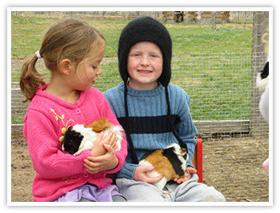 Children at The Farmhouse care for animals – sheep, cattle, goats, horses, alpacas, chooks, ducks, rabbits, guinea pigs, mice and pigs – that live right next door to where the children play ! Children will also collect the chook’s eggs every day to take to their cooking classes. Meet Isabella Bella and Midnight…. 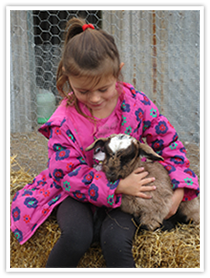 These two little goats have been hand-reared and consider themselves two of The Farmhouse kids!